Defying all calls for a reversal to the extended stock rally, US equity futures continued to climb overnight ahead of tomorrow's "either dovish or extremely dovish" FOMC meeting, rising alongside European stocks on Tuesday which snapped higher following a subdued session for Asian stocks as the Stoxx 50 printed 2019 highs, while the DAX stalled just shy of its 200DMA. As a result, global shares enjoyed their longest winning streak since Oct 2017 ahead of a Federal Reserve meeting, while the pound jumped as algos bought the British currency after another dramatic twist in the Brexit plot bolstered bets on a lengthy delay to the process. 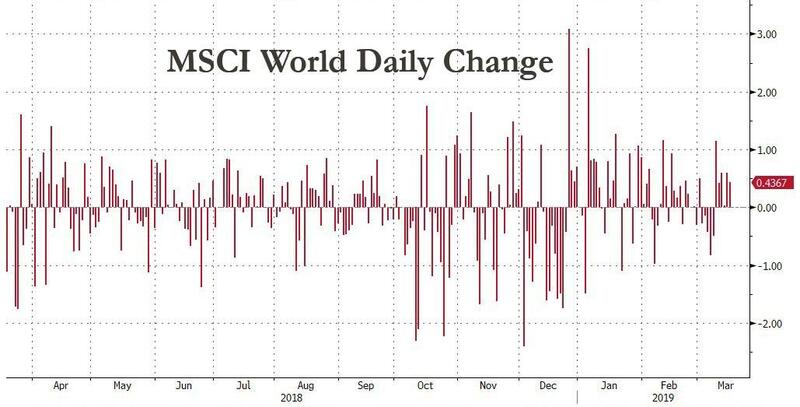 With traders expecting nothing but more good news from the Fed’s two-day meeting which starts later, which is expected to cut its "dot" forecast to just one rate hike in 2019 and at most one more in 2020, Europe’s early gains lifted MSCI’s All world index for a seventh straight day, the longest streak of consecutive gains since Oct 2017, and to its highest since October. In Europe, the Stoxx 600 Index advanced after a quiet start, as almost every sector turned green. Autos, basic resources and retailers lead indices higher, construction and real estate names underperform but trade little changed on the day. 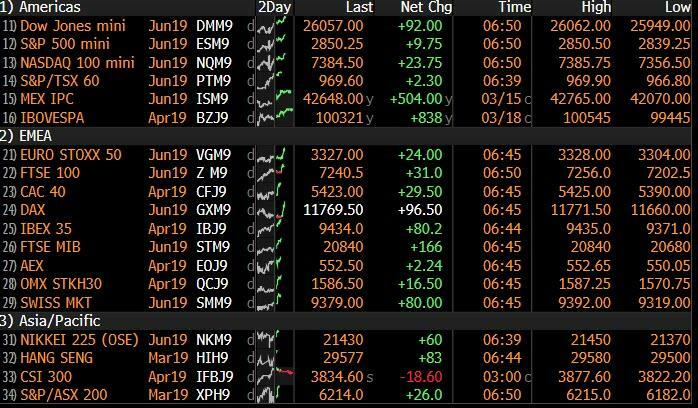 Earlier in the session, Asia traded in a tight range as equities posted modest losses in Japan, China and Australia, but they rose in Hong Kong and India. S&P futures rise over 11 points, rising to a fresh 5 month high and set for another green session after bank and tech stocks helped extend the year’s 20% charge for U.S. markets on Monday. In FX, sterling rebounded back over 1.33 after slipping to as low as $1.3183 in the previous session as lawmakers cast doubt on Prime Minister Theresa May’s third attempt to get parliament to back her Brexit deal. As Reuters notes May’s Brexit plans were thrown into further turmoil on Monday when the speaker of parliament ruled that she could not put her divorce deal to a new vote unless it was re-submitted in fundamentally different form. May has only two days to win approval for her deal to leave the European Union if she wants to go to a summit with the bloc’s leaders on Thursday with something to offer them in return for more time. Meanwhile, senior diplomats said the European Union leaders could hold off making any final decision on any Brexit delay when they meet in Brussels later this week, depending on what exactly May asks them for. “The predominant notion adopted by the market is that as long as the worst case scenario of hard Brexit is avoided by delaying Brexit, the pound is a buy on dips,” Rabobank strategists said in a note, however adding that "In the coming days faith amongst traders in an ability of UK MPs to make rational decisions could fade rapidly and cause a major selloff in GBP." The dollar was again feeling the strain of a dovish Fed, sliding to a two-week low on the bets that with both U.S. and global growth now slowing the Fed will need to put its rate hike plans on ice. "The market has priced that the Fed’s next move will be a (rate) cut,” said Charles Schwab chief investment strategist Liz Ann Sonders, at adding that it may have to if U.S. data continues to sour and key indicators such as the U.S. yield curve start flashing warning signs again. As we discussed extensively in recent days, investors will particularly look to see whether FOMC officials have sufficiently lowered their interest rate forecasts to more closely align their “dot plot”, a diagram showing individual policymakers’ rate views for the next three years. Traders will also be looking for more details on the Fed's plan to stop cutting the Fed’s holdings of nearly $3.8 trillion in bonds. “A key focus is when the Fed will omit the word ‘patient’ from its statement, as that would be a pre-requisite for a rate hike,” said Toru Yamamoto, chief fixed income strategist at Daiwa Securities. In the latest Brexit news, UK PM May is said to request a 9-12 months delay to Brexit, according to The Sun, while reports in the Guardian suggested that the EU will formally agree on Brexit delay this week. UK Conservative MPs reportedly demand a departure date from PM May in return for them passing her Brexit deal, while there were also reports that hardline Tory Brexiteers were said to have threatened to strike if PM May goes ahead with idea to delay Brexit by 1 year. In geopolitical news, US Senior Arms Control Officials sated that Iran's missile program destabilises the region and increases the risk of a regional arms race, US Official says it will aggressively counter Iran's proliferation of ballistic missiles are unlawful arms transfers. Adding that the only way for North Korea to achieve security and development is to abandon all weapons of mass destruction along with all ballistic missile programs. Meanwhile, oil prices hit 2019 highs, supported by supply cuts led by producer club OPEC. U.S. sanctions against oil producers Iran and Venezuela are also boosting prices, although traders said the market may be capped by rising U.S. output. WTI (+0.4%) and Brent (+0.5%) are somewhat firmer after a quiet overnight session, although WTI prices are inching closer to USD 60/bbl having surpassed the USD 59.50/bbl mark to the upside; as oil closed at its highest level YTD yesterday. News flow for the complex continues to be quiet after OPEC cancelled the April meeting and are to decide on output cuts in June. Gold (+0.2%) is largely unchanged, trading around the middle of the day’s range on a lack of catalysts and a subdued dollar ahead of this weeks key events. Elsewhere, spot Palladium has passed USD 1600/oz for the first time this morning following reports that Russia are considering a ban on the exports of precious metal scrap, in an attempt to promote domestic refining. Russian are one of the worlds top Palladium exporters, responsible for around 21% of total palladium exports in 2017 by value. Asian stock indices traded indecisively amid a lack of key drivers for the region and with participants cautious ahead of the upcoming risk events. ASX 200 (-0.1%) was choppy as strength in mining names vied with the weakness in energy and financials in Australia, while jittery trade in the Nikkei 225 (-0.1%) largely reflected currency fluctuations. Elsewhere, sentiment in China was also fickle in which the Hang Seng (+0.2%) and Shanghai Comp. (-0.2%) swung between gains and losses as focus centred on earnings and after the continued but tepid liquidity effort by the PBoC. Finally, 10yr JGBs were initially quiet amid the indecisive risk sentiment in the region, although prices later found support following a 20yr auction in which all metrics improved from the previous month. RBA Minutes from March 5th meeting reiterated that the board sees no strong case for near-term move and that scenarios are more evenly balanced than last year. Furthermore, the board noted significant uncertainties regarding the economic outlook and that trade tensions remain source of uncertainty for global outlook but added that the labour market continued its improvement and that unemployment is seen to decline to 4.75%. Major European equities are firmer [Euro Stoxx 50 +0.5%] following a relatively indecisive overnight session, where main Asian indices finished essentially flat ahead of this weeks key risk events. Notable movers this morning include Antofagasta (+4.0%) after FY earnings and the Co. stating they expect 2019 to be another record setting year, as such the Materials sector is higher by around 0.7%; more broadly all sectors are in the green. Towards the bottom of the Stoxx 600 are Deutsche Bank (-2.5%) and Commerzbank (-2.5%), likely affected by some retracement from yesterdays gains on conformation of merger discussion and Fitch stating that the talks highlight challenges and pressures of both banks to improve profitability. Commerzbank are also hampered by being downgraded at RBC. Elsewhere, following reports of a cyber attack, the impact of which is still being assessed, Norsk Hydro (-1.6%) are in the red; subsequent reports indicate that only the Co. has been affected by the attack. In FX, the The broad Dollar remains depressed in advance of FOMC day 1 amidst widespread anticipation that the March policy meeting will culminate in a further dovish shift via downgraded SEP forecasts and more details about the earlier end to QT. Indeed, the index has probed a fraction deeper beneath recent lows and is currently below key technical support at 96.434 (50% Fib retracement of the prior move from 95.157 to 97.711), which could be telling on a closing basis even before the Fed pronouncements tomorrow and Chair Powell’s presser. G10 - Notwithstanding the generally soft Greenback, ranges are relatively tight with only marginal deviations around data for the likes of the Pound and Aussie. Cable has recovered from yesterday’s Brexit upset with the aid of an almost universally strong ONS labour market report to retest offers and resistance ahead of the 1.3300 level, while in contrast Aud/Usd has lost more momentum above 0.7100 after RBA minutes underlining the neutral stance and house price data compounding weakness in the economy overall. Elsewhere, Usd/Jpy has pulled back a bit further towards 111.00 having retreated through the 200 DMA at 111.45, but Eur/Usd is still butting up against upside chart hurdles above 1.1350, including a Fib at 1.1373, which represents a 50% reversal from 2019 high to low. The Franc is attempting to breach parity again following a solid Swiss trade surplus and pre-SNB, while the Loonie is also eyeing 1.3300 peaks vs its US counterpart against the backdrop of firmer crude prices. Back down under, the Kiwi is pivoting 0.6850 ahead of NZ Q4 current account data and the latest GDT auction. Note, some BIG OPTION EXPIRIES could factor in the absence of anything more directional ahead of the NY cut today, with 1 bn in Cable at 1.3290-1.3300, 1.2 bn in Usd/Jpy between 11.30-40 and 1.3 bn in Aud/Jpy from 79.35-50 as the cross hovers just shy of 79.00. In commodities, WTI (+0.4%) and Brent (+0.5%) are somewhat firmer after a quiet overnight session, although WTI prices are inching closer to USD 60/bbl having surpassed the USD 59.50/bbl mark to the upside; as oil closed at its highest level YTD yesterday. News flow for the complex continues to be quiet after OPEC cancelled the April meeting and are to decide on output cuts in June. Looking ahead we have the US API Weekly release, which previously indicated a crude stocks draw of 2.6M. Gold (+0.2%) is largely unchanged, trading around the middle of the day’s range on a lack of catalysts and a subdued dollar ahead of this weeks key events. Elsewhere, spot Palladium has passed USD 1600/oz for the first time this morning following reports that Russia are considering a ban on the exports of precious metal scrap, in an attempt to promote domestic refining. Russian are one of the worlds top Palladium exporters, responsible for around 21% of total palladium exports in 2017 by value. In terms of the day ahead, outside of all things Brexit, we’ll get January factory orders and final January revisions to durable and capital goods orders. Away from that, the ECB’s Praet will speak this morning. Brazil President Bolsonaro will also visit the White House and meet with President Trump. I look forward to the latest TV viewing figures in the U.K. as I expect that the British Parliament channel will have gone up from a handful of MPs' family members to a global fanbase of millions over the last few weeks. I’m surprised Netflix haven’t bought up the rights. Indeed, I was reading over the weekend that the speaker of the House of Commons John Bercow has become a mini celebrity in Germany, amongst other places. Even my daughter now shouts “order, order”. Well, after yesterday, his fame or infamy will multiply further. We were aware of the rule that you couldn’t bring back an identical motion to the House of Commons but we all assumed that enough precedent has already been thrown in the trash can over recent months in Parliament that if it were decided that a fresh vote may yield different numbers then it would easily find a way of happening. However, the speaker Mr Bercow thought differently yesterday and actioned a ruling that was introduced in 1604 to prevent the government from bringing back the Withdrawal Agreement for a meaningful vote if there are no changes to it. The solicitor general said that “there were ways around this” but the reality is that 1) the DUP haven’t yet said they’d support the deal after hopes that the last 24 hours would see such an announcement and 2) time is running out to bring the vote before the EU summit on Thursday/Friday. We’d need to find an immediate way round the ruling and for a fresh vote to be announced tonight for it to come in time. Given the constitutional crisis and the current lack of DUP support, it now looks very likely that Mrs May will go to the EU summit to ask for an extension without MV3 having taken place and without a definitive plan as to what the extension is for. Meanwhile, The Sun reported late last night that PM May is drafting a letter to the EU Council President Donald Tusk to formally ask for a Brexit delay of between 9 to 12 months. The same report also added that hardline Tory Brexiteers are threatening to go on a strike if PM May indeed asks for such a lengthy delay. Sterling followed the evolving news and with no sign of a breakthrough with the DUP it drifted lower all day before hitting a low of $1.3185 (-0.79% at that point) post the Bercow ruling but clawing back to $1.3255 at the close, still down -0.26% on the day. This morning we are up a little more at $1.3273 (+0.14%). Markets did temporarily swoon alongside the slide in the pound, when the speaker intervention gave markets a bit of a shock. The S&P 500 dipped into negative territory and the VIX index rose almost a full point, but the moves subsequently retraced alongside the stabilisation in the pound. The S&P 500 ended the session +0.37% higher, with the NASDAQ up +0.25%. The DOW lagged a little again at +0.25%, as Boeing continued to underperform, shedding -1.77% and taking its six-session loss to -11.92%. Elsewhere, markets appeared to be waiting on the sidelines for some of the potentially bigger events later this week. The STOXX 600 closed +0.27% and traded in the smallest range (0.29%) since January 21st. In terms of sectors, there was a decent outperformance for energy and financials, with telecoms and utilities struggling. Energy got a boost as WTI climbed +0.80% after OPEC+ came to the joint recommendation to delay a decision on extending production cuts to June. In rates, Treasuries were marginally weaker with 2y and 10y yields just over+1bp higher while the 2s10 curve remained comfortably within its recent range at 14.9bps. In Europe, the periphery was the bigger winner with BTPs -3.9bps tighter and yields in Portugal -4.7bps lower following the sovereign rating upgrade by S&P on Friday. Emerging markets outperformed, the MSCI index gaining +1.11% to reach its highest level since last August. The Brazilian real (+0.59%) and Indian rupee (+0.82%) led gains in the currency space with an index of EM FX advancing +0.31%. It seems like markets are in something of a holding pattern ahead of tomorrow’s Federal Reserve meeting. Our economists have published their expectations here , and they expect few surprises in the statement or Powell’s rhetoric. They anticipate the median rate expectation for 2019 will fall to one hike, and will be monitoring for any signals about balance sheet policy or what conditions are needed to allow for another hike. Matt Luzzetti also published a note yesterday ( here ) which shows that higher Fed rate hike pricing is actually, and somewhat counterintuitively, consistent with easier financial conditions. This is because positive economic data helps equities and credit, while also boosting confidence that the Fed can hike. So we certainly seem to be in a “good news is good news” environment. Overnight, markets in Asia are heading lower in the absence of any clear fresh drivers with the Nikkei (-0.12%), Hang Seng (-0.23%), Shanghai Comp (-0.22%) and Kospi (-0.11%) all down. Elsewhere, futures on the S&P 500 (+0.06%) are trading flattish and the Japanese yen is up +0.15%, along with most G10 currencies this morning. Back to yesterday and on the data front, the euro area trade balance for January was slightly larger than expected at €17bn on a seasonally adjusted basis, and the December figure was revised upwards as well. That likely reflects somewhat tepid European demand earlier this year, though it could also indicate some improvement in the external environment. In the US, the NAHB survey for March printed at 62, the same as in February, which signals some evidence of conditions bottoming out, though there isn’t much sign of a more robust rebound. Homebuilder stocks underperformed, falling -0.34%. In terms of the day ahead, outside of all things Brexit, this morning we get the January and February employment report in the UK, where the consensus is for an unchanged earnings reading (+3.4% 3m/yoy) and unemployment rate (+4.0%). We’ll also get January construction output data for the Euro Area, Q4 labour costs data for the Euro Area and the March ZEW survey in Germany. In the US, we’ll get January factory orders and final January revisions to durable and capital goods orders. Away from that, the ECB’s Praet will speak this morning. Brazil President Bolsonaro will also visit the White House and meet with President Trump.